As the nights close in, Indian comfort food tops my list of things I crave. And nothing spells comfort food louder than a warming curry and some rice with some spicy kebabs on the side. Problem is when these craving hit mid- week and I am simply too exhausted to make elaborate meals. That’s when I turn to my store cupboard for some help. 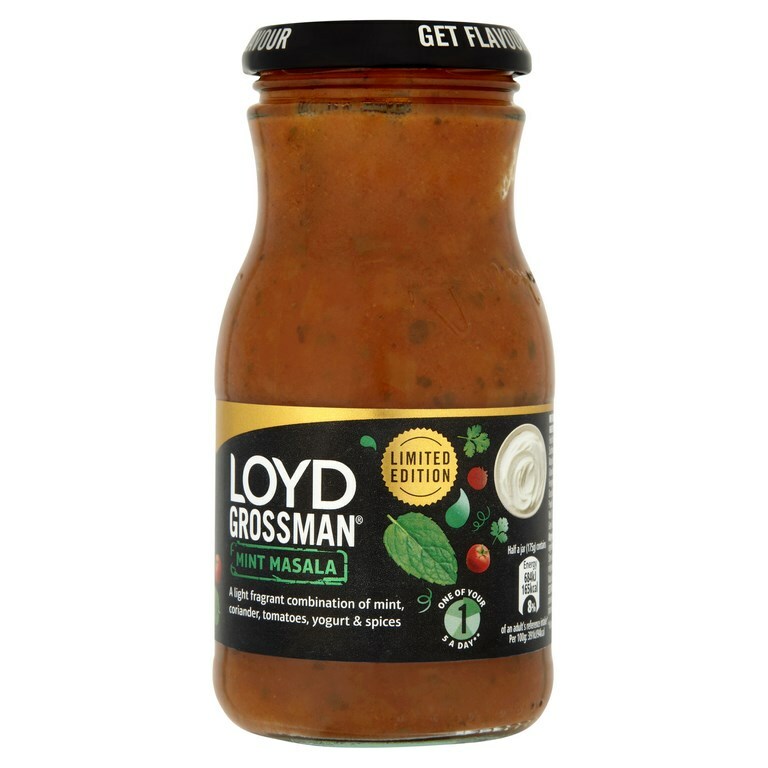 Loyd Grossman has come up with a new Limited Edition Mint Masala gravy sauce which I was sent to review along with some delicious naan , a bottle of Chicken Tikka Masala and boil in the bag Basmati rice all packaged in this beautiful box ! I wanted to create something easy to make using the Mint Masala Gravy sauce and came up a recipe for Minty Chicken Masala Kadhai – best served with some buttery warm naan! Wash and cut the chicken breasts into cubes. Chop the red onion fine. 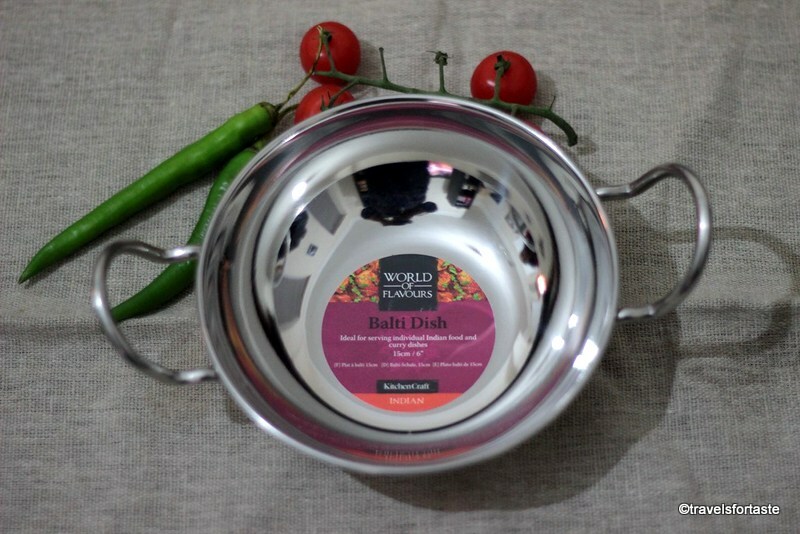 Heat the oil in a saucepan and when it is hot add the bay leaves and red chillies and saute till the bay leaf begins to change colour , then add the onions. Saute the onions till they turn pink and reduce. Then add some of the umami paste and 2 large tbsp of the Lloyd Grossman Limited Edition Mint Masala gravy sauce and saute for 2 minutes on a low flame stirring to ensure the onion does not burn. Season with salt. Take off the flame and set aside. After 30 minutes heat the griddle pan till its very hot on medium heat and spritz some oil on it. Drop the marinated chicken cubes on the pan. ‘Bruise’ the chicken cubes on the pan till they are grilled, flip and grill on the other side , repeat until cooked. Ensure chicken pieces are not too large as they will remain raw in the middle otherwise . Once cooked add them into the sauteed onion thick gravy sauce. Mix well and saute on a very low flame for half a minute. To serve heat some butter on a large pan and heat the naan till they are soft ,buttery and ready to eat. 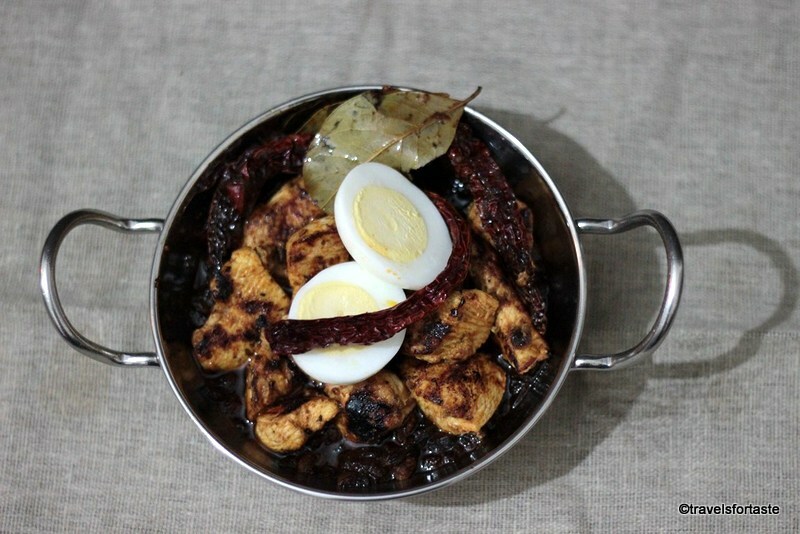 Transfer the Minty chicken kadhai into the shiny balti serving dish and place the halved boiled egg on top. Vegetarians needn’t feel disappointed . Try the same recipes using Paneer or Indian cottage cheese, only thing is while ‘bruising’ the paneer on the griddle pan it has to be handled gently so as not to break the cubes and also while mixing it into the thick onion gravy it should be mixed with care. GIVEAWAY for 2 LUCKY WINNERS ! 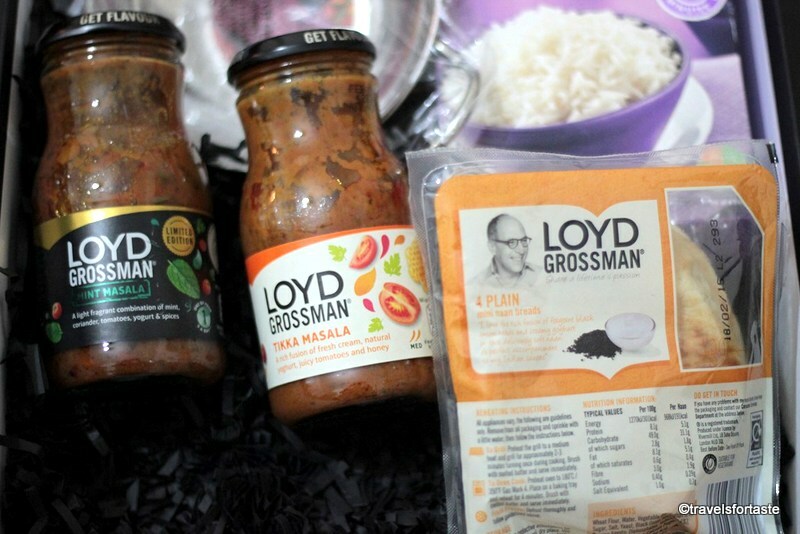 WIN ONE OF TWO Loyd Grossman GIFT HAMPERS! 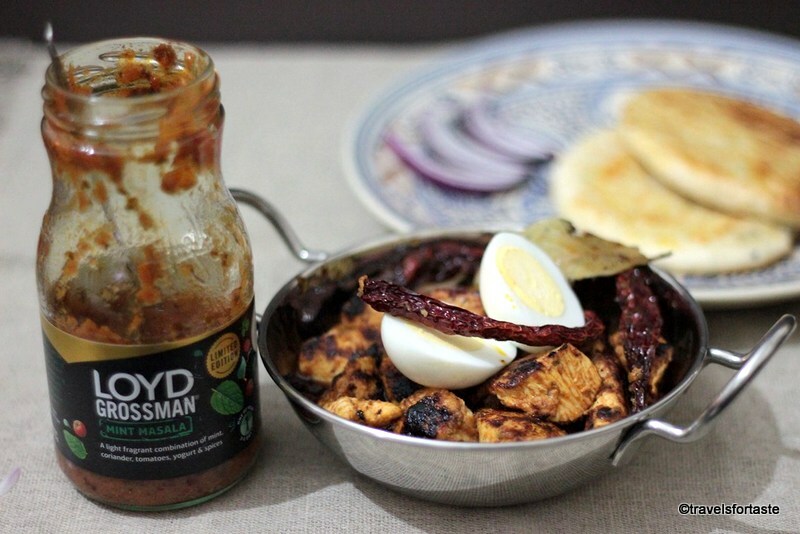 Each Gift Hamper contains LIMITED EDITION Loyd Grossman Mint Masala – 1 bottle , Loyd Grossman Chicken Tikka Masala 1 bottle, Pack of 4 naans from Loyd Grossman , one packet with 4 boil in the bag basmati rice pouches and a SHINY new BALTI serving dish – dishwasher proof. Deadline for entering this contest is 8th November ‘2014 midnight GMT. The giveaway prize is as mentioned in the post. Neither Lloyd Grossman or I am liable for any damage of hamper and / or contents in transit. Please allow a minimum of 15 days for delivery of the prize, which may reach earlier or later. 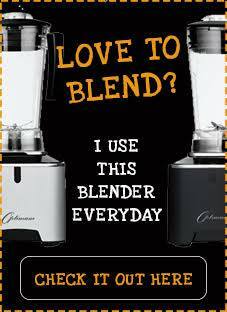 The winner will be notified on 9th Nov’14 on Twitter by me and here on my blog post. I shall tag the 2 winners on Twitter via their twitter id’s . If you are declared as the winner you agree to allow me and Lloyd Grossman to contact you via email id to arrange for the gift hamper to be sent out to you. If the TWO winners fail to respond BY 12th Nov’14 then other winners will be chosen. 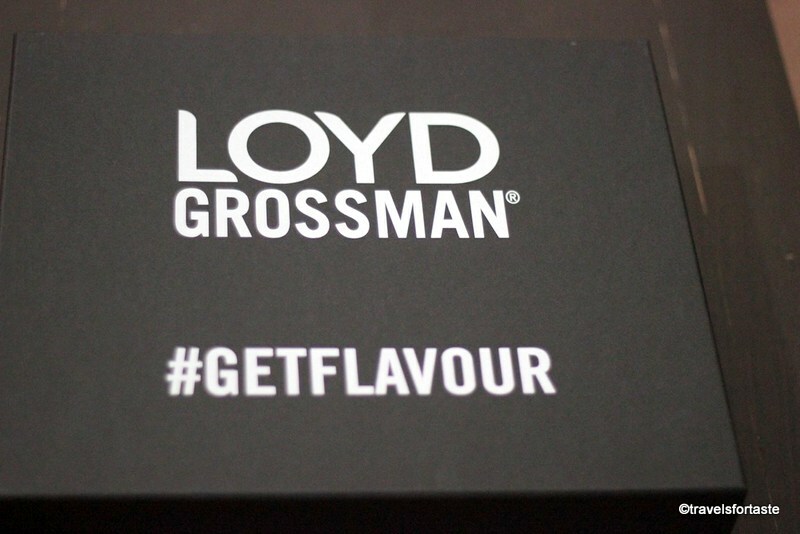 CONGRATULATIONS to the 2 LUCKY winners of this fabulous GIVEAWAY of LIMITED EDITION Loyd Grossman Mint Masala Gift Hampers!!! AND The lucky winners are: *DRUMROLLS* ……. 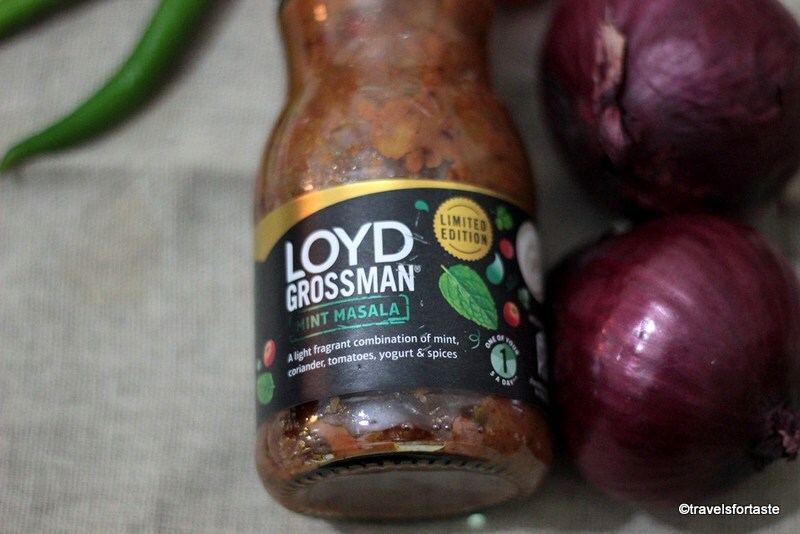 *With thanks to Loyd Grossman for sending me a complimentary Loyd Grossman LIMITED EDITION Mint Masala Hamper . No monetary compensation was offered for a positive review. As always all opinions expressed here are entirely my own. I love a spice vindaloo with onion bajis and naan bread! I really love Gajar ka Halwa! I’m very feeble when it comes to spices, so something very mild like a Chicken Korma (a masala if I’m feeling daring!). I’m like the wimp of the house, everyone else likes very hot and spicy food! I love all Indian food that I have tried. My favourite is a lamb balti. 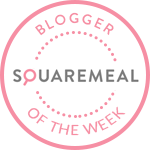 @Rainbow1861 – Love Indian food in general but my favourite is: Lamb Vindaloo! Apart from the breads which I adore and pillau rice (I can eat that on it’s own), I can’t say I have a favourite dish as I like to try new things everytime I eat Indian. There is one dish I look for on a restaurant menu but seldom find and that is lamb chops marinaded in what seems like ginger and chillies (and sometimes orange too) to make them spicy and of course shish kabobs and seekh kebabs and all those variations as starters. Reading this back it seems like everything is my favourite 🙂 Have tweeted as @poppyflimflam. Love all indian food, but if pushed would be either Chicken Jalfrezi or a Goan curry, nice and spicy. So hard to choose but as a push I would have to choose a chicken Jalfrezi , thanks! naan bread & poppadoms.. im not really one for spicy foods, my OH however loves it! I love a good Lamb Rogan Josh! Butter chicken – made in Australia, lovely! Don’t make me choose!… lamb rogan josh, I think…. 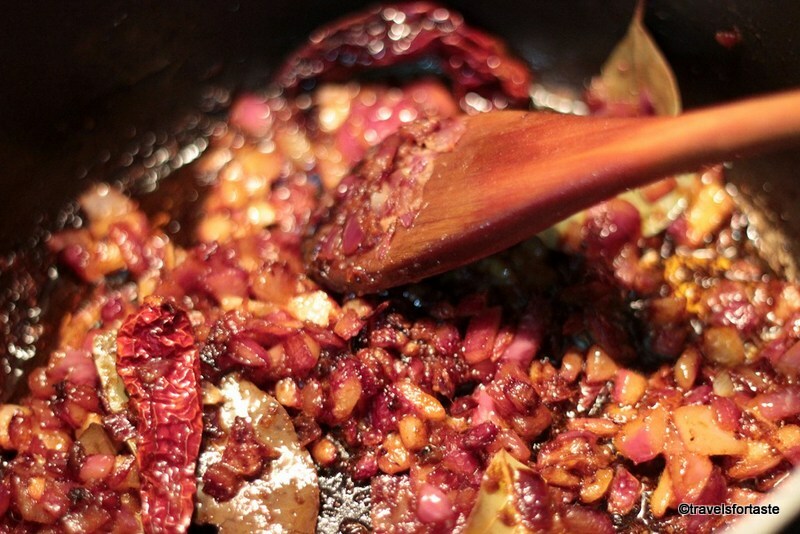 I Love all sorts of curry – preferably hot and spicy! Chicken Madras is great, or a nice Vindaloo! My husband and four children all love a homemade curry but I have to confess I’m not a great lover! My favourite Indian food (apart from poppadoms) is a well cooked chicken passanda. I love chicken korma, egg rice and nan bread! I like Chicken Madras the best. Butter chicken and chicken passander love them both. I love Chicken Tikka Garlic! I love Indian lime pickles!! love lamb korma with naan and pops!! I have not eaten a lot of Indian food apart from curries but I do like Vegetable Samosas the most. Especially homemade ones given to me by friends. My favourite is chicken chasni. I love vegetable samosa’s and vegetable dhansak!